The redistribution of impact forces resulting in increased stress at local points in bone. The action of muscle pull across bone. Histological changes resulting from bone stress occur along a continuum beginning with vascular congestion and thrombosis. This is followed by osteoclastic and osteoblastic activity leading to rarefactio , weakened trabeculae and microfracture and ending in complete fracture. This sequence of events can be interrupted at any point in the continuum if the process is recognized. Similarly ,the process of bony remodeling and stress fracture in athletes is recognized as occurring along a clinical continuum with pain or radiographic changes presenting identificable markers along the continuum. Since radioisotopic imaging and MRI can detect changes in bone at the phase of accelerated remodeling, these investigations can show stress-induced bony changes in the continuum. Stress fractures may occur in virtually any bone in the body. The most commonly affected bones are the tibia, metatarsals, fibula, tarsal navicular, femur and pelvis. A list of sites of stress fractures and the likely associated sports or activities . The diagnostic features of a stress fracture. It is important to note that a, bone scan although a routine investigation for stress fractures, is non-specific, and other bony abnormalities such as tumors and osteomyelitis may cause similar pictures. It may also be difficult to localize the site of the area of increased uptake precisely, especially in an area such as the foot where numerous small bones are in close proximity. Localized pain and tenderness over the fracture site. A history of a recent change in training or taking up a new activity. X-ray appearance is often normal or there may be a periosteal reaction. Abnormal appearance on radioistopic bone scan (scintigraphy), CT scan or MRI. MRI is being increasingly advocated as the investigation of choice for stress fractures. Even though MRI does not image fractures as clearly as do computed tomography (CT) scans, it is of comparable sensitivity to radioisotopic bone scans in assessing bony damage. The typical MRI appearance of a stress fracture show speriosteal and marrow edema plus or minus the actual fracture line. The treatment of stress fractures generally requires avoidance of the precipitating activity. The majority of stress fractures heal within six weeks of beginning relative rest. Healing is assessed clinically by the absence of local tenderness and functionally by the ability to perform the precipitating activity without pain. It is not useful to attempt to monitor healing with X-ray or radioistopic bone scan. CT scan appearances of healing stress fractures can be deceptive as in some cases the fracture is still visible well after clinical healing has occurred. The return to spot after clinical healing of a stress fracture should be a gradual process to enable the bone to adapt to an increased load. An essential component of the management of an over use injury is identification and modification of risk factors. There are, however, a number of sites of stress fractures in which delayed union or non-union of the fracture commonly occurs. These fractures need to be treated more aggressively. The sites of these fractures and the recommended treatment. Sports medicine, like all other branches of medicine, aims at the complete physical, mental and spiritual well-being of a sportsperson. A healthy mind in a healthy body is a concept, which is more true to a sportsperson than anybody else is. Positive thinking, fair play and sportsmanship should be the hallmark of a true sportsman. We, the doctors and the therapists, aim to keep a sportsperson physically fit so that the rest of the objectives mentioned above are attained automatically. However, one has to remember that fitness testing is not done only at the initial stages but needs to be done repeatedly at every stage of an athlete or a sportsperson’s life. The second stage of prevention of sports-related injuries is assessing whether a sportsman is fit enough to resume the sporting activity after the initial layoff. There is nothing more dangerous than an unfit or partially fit person resuming the sporting activity. It may spell a doom to his otherwise flourishing career in sports. A sportsperson has to satisfy certain norms before he can finally be sent back to the field. 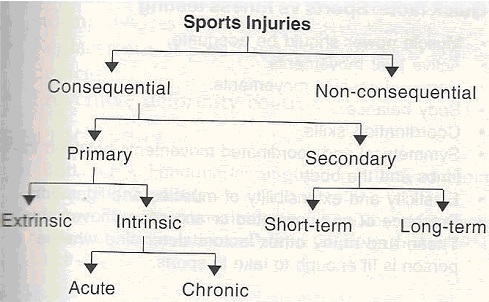 Among the various classifications proposed for sports injuries, the one proposed by Williams (1971) is widely used and recommended. Human: Black eye due to direct blow. Implemental: May be incidental (as in blow from a hard ball) or due to overuse (blisters from oars). Vehicular: Clavicle fracture due to fall from cycle, etc. This could be acute or chronic. Acute, e.g. acute tenosynovitis of wrist extensors in canoeists. Chronic, march fracture in soldiers, etc. Short-term: For example, quadriceps weakness. Long-term: Degenerative arthritis of the hip, knee, ankle, etc. These are not related to sports but are due to injuries either at home or elsewhere and are very not connected to any sports (e.g. slip and fall at home). Sports medicine usually deals with minor orthopedic problems like soft tissue trauma. Very rarely, there may be serious fractures, head injuries or on the field deaths. There is nothing unusual about these injuries except that a sportsperson demands a 100 percent cure and recovery while an ordinary person is satisfied and happy with a 60-80 percent recovery. The difference is because of the desire of the sports person to get back to the sport again, which requires total fitness. The following are some of the most common sports -related injuries one encounters in clinical practice. Injuries to the finger joints. Compartmental syndrome of the leg. Injuries of sesamoid bone of the great toe. All these injuries have been discussed in relevant sections. These are the same as for any ortbopedic-resared disorders and consist of plain X-ray, CT scan, bone scan, MRI, arthroscopy, arthrography, stress X-rays etc. This is discussed under three headings prevention, treatment proper and training. The best way to treat a sports injury is to prevent it from happening. Nothing is better than preventing the injury. Treatment of individual sports-related disorders is discussed under suitable sections. However, a mention is made here of the general principles of treatment which is applicable to all sports injuries. M- Medicines like painkiller s, etc. M- Modalities like heat, straps, supports, etc. After immobilization and rest, early vigorous exercises should be commenced at the earliest to prevent muscle weakness and atrophy. 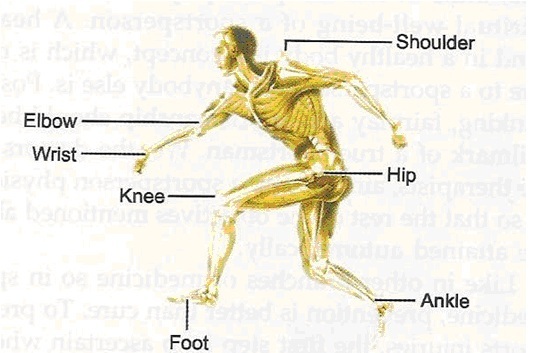 To prevent joint stiffness, early mobilization ha s to be done first by passive movements and later by active movements. To improve the strength, resistive exercises are added. Unlike the conventional once a day treatment, a sportsperson needs to be seen at least 2-3 times a day. As mentioned earlier, allow resumption of sporting activity only after the sportsperson assumes 100 percent fitness. Mind training is as important as physical training. By repeated counseling, improve the psychological status of the patient to avoid depression, anxiety and negative attitudes, which may develop during the injury. Orthopedic and surgical treatment to be undertaken at appropriate situations. The physiotherapist has to train a sportsperson in various exercises to enable him to keep his fitness level very high. After conducting a fitness testing, the therapist has to subject an athlete to various forms of exercises to increase the endurance, strength, running, weight bearing, etc. The following are the various forms of exercises. After the vigorous workout mentioned above, the sportspersons are taught methods of relaxation and body stretches. Before an athlete or a sportsperson resumes his sporting activities, a fitness testing is carried out and only then, he is allowed to take to the sports provided he is 100 percent fit.